The family-run restaurant brings hearty stews and fufu to East Oakland. 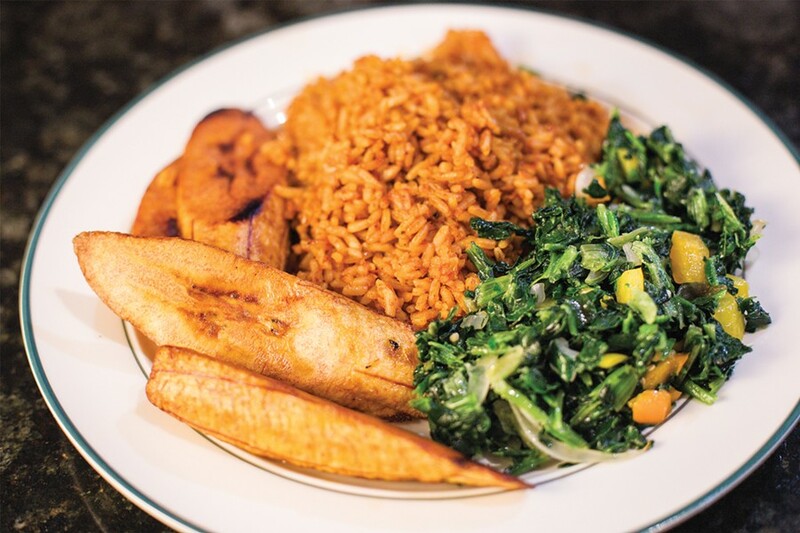 Jollof rice, plantains, and greens — a vegetarian feast. In Hausa, one of Nigeria's many languages, "buka" refers to a casual, local eatery serving traditional food. Ruth's Buka is 100 percent a buka. The small, bare-bones restaurant sits on a residential stretch of Foothill Boulevard in East Oakland — an easy-to-miss location if you're not actively looking for it. Ruth Ogbe opened the place in late 2015, although her husband, mother, and children all help out. Ogbe moved to Oakland from Nigeria in 1998, and food has long been the family business. Her mom also owned a restaurant back in Africa. Now, mother and daughter — and more family members — are working together again. Over the course of my three visits, I encountered the whole family and felt like I accidentally stumbled into their home — sometimes uninvited. Despite checking the place out at different times for lunch and dinner, I always seemed to interrupt one of the family members eating or texting in the otherwise empty, burnt-orange space. Shortly before its 8 p.m. closing one evening, though, I witnessed Ruth's Buka transform into a real gathering place for the local Nigerian community. Everyone seemed to know each other, catching up in their native tongue before digging into their meals. Even without many other customers, service tended to be a bit slow. If you come with a group, plan to share, as the dishes always arrived one after the other with a lengthy lag time. Your rewards are potentially huge, though, especially if you crave West African flavors. These particular spice sensations are difficult to come by in the East Bay. The bulk of Ruth's Buka's menu is devoted to soups, although the majority are more like saucy stews paired with a starch. Pepper soup is the exception, and it was one of my favorite dishes — light, thin, and slurpable, intensely peppery and floral, with a mass of boney, skin-on tilapia swimming within the pool of grey. As winter approaches, I'd return for this sinus-clearing dish. The other soups follow a mix-and-match format, where you can choose your meat and accompanying ball of dough, most of which contained cassava root or yam flour. Whether it was fufu, pounded yam, or amala, the overall texture and blank-slate flavor felt very similar — at least they did to me, someone with admittedly little-to-no prior experience with them. Regardless of which one you choose, you'll rip off a chunk of the stretchy, elastic dough and use that to spoon stew into your mouth. You'll also get a big bowl of water to wash off your hands. 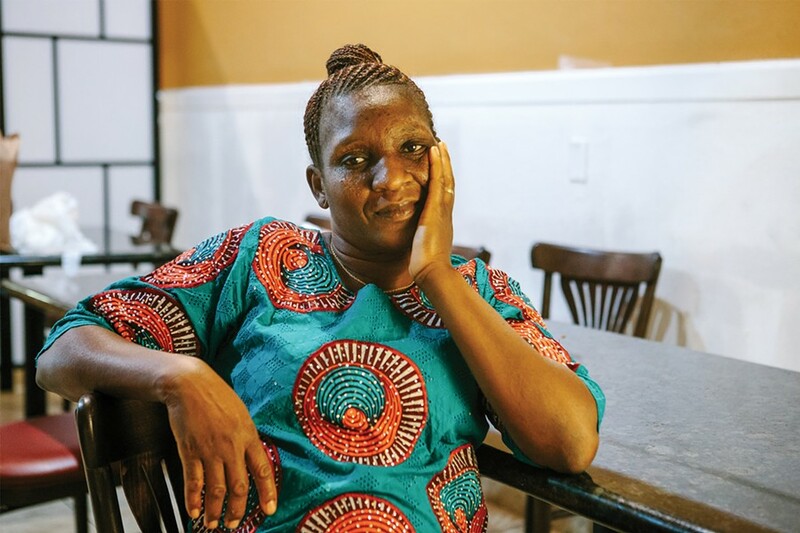 Ruth Ogbe opened her restaurant two years ago. If you're not a fan of fufu and the like, you can substitute white rice instead. I was surprised it cost $5 extra — on the phone, Ogbe told me it should have actually been $3 — but it was some of the most delicious, nutty white rice I've had in awhile. Every soup I tried was tasty. The egusi, a Nigerian classic thickened with pounded melon seeds, was complex and fiery. The efo riro, a combo of leafy greens and tomatoes, was simple and comforting. The banga, a palm fruit soup, was sweet and savory, though its oily consistency made it extra challenging to scoop up with fufu. Try it with rice instead. I cared the least for the okra soup, which was the blandest of the lot, and its slimy texture also presented a logistical challenge — again, rice would make it easier to enjoy. For those new to West African food, Ruth's Buka's jollof rice combo plates are approachable crowd-pleasers. The tomato-stained rice retained a nice bite, the pile of sautéed greens tasted fresh, and the plantains arrived caramelized to prime sweetness. With the meat of your choice, it's a delicious, wholesome, and hearty plate of food. My general recommendation is to go for the fish. With what? Everything. There is, for example, a goat pepper soup, but the fish was so meltingly tender that I don't think you should pass it up. With the jollof rice, I received firm, fleshy whiting soaked in tomato sauce. I also ordered the whole fish, a tilapia covered in tomato sauce and cooked perfectly with more of those plantains on the side. When I ordered beef and goat, about half of the pieces were tough and chewy. The chicken was more consistently tender — just not as impressive as the fish. Do add some extremely affordable appetizers to your order, such as chin-chin, a crunchy fried snack; puff-puff, a Nigerian doughnut; or a savory meat pie with soft pastry. On the side, there's a generous rectangle of moi moi, a smooth, steamed bean pudding flecked with corned beef. Ruth's is also stocked with Nigerian beverages, including the divisive malty soda Malta. I preferred the ginger hibiscus drink from Hayward-based, Nigerian-owned Taruwa Food & Spices, which packed a serious kick.